After a long day of swapping keys, the group of us sat around a table full of chicken fajitas comparing notes. "It's remarkable how similar the driving experience is. Even with more than four times the power, that 930 drives a lot like my 912E," I said, perhaps letting the word 'similar' do too much work in that statement. Both cars are built on largely the same chassis, the 930, a bit wider, more powerful, and with more weight hung out over the rear axle, is only three years newer than my '76 after all. Add to that, both of these Porsches feature wider-than-stock sticky BF Goodrich g-force tires, giving them each prodigious grip. After having spent two days at the wheel of my 912E, jumping behind the wheel of the 930 provided an instantly familiar arms-out-legs-bent driving position. But, I'm getting ahead of myself. A couple of weeks ago I was on an event called the Coastal Range Rally, a three day enthusiast rally that began in San Juan Bautista, CA and wound its way down the mountain range just inland of the Pacific coast of California, through Paso Robles, down to Ventura, and back. It was the second day that my good friend Patrick, who had brought the Makellos Classics shop 930 on the rally, asked if I wanted a chance to drive the widebody wonder. I'd heard about the car beforehand, seen photographs of the 80s-tastic gradient stripe, and loved the blue-over-black Fifteen52 Outlaw wheels from afar. It looks even more incredible in person. I'm not one to turn someone down when they hand me the keys to their Porsche, so we found a particularly taxing mountain road to trade driver's seats, and I settled into the Turbo. At least that's what they say. They're unpredictable, thanks to a hellish weight imbalance and a sharp boost threshold. If you carry too much speed through the corner, you'll snap oversteer yourself off a cliff, or at least into a tree. If you're too hard on the throttle, you'll die. If you're too hard on the brakes, you'll die. If you look at it wrong, you'll die. The legend of the 930 being a car you can't survive a tussle with, being a 'widowmaker', being impossible to tame, is one that pervades the Porsche sphere. This is said to be a car that only the most talented wheel men can bend to their will. It's got a lot of baggage, so while I was gung-ho to pull away, I felt pangs of genuine trepidation as I twisted the key in the ignition and notched the four-speed gear lever into first. The Porsche is largely stock, from the bodywork to the engine internals, but it's been taught to breathe a little deeper with a step-larger K27 turbocharger, a smooth flowing old-school intercooler from Andial, and a turbo-back exhaust built by Powerhaus in the 1980s. That small build sheet adds an even hundred horsepower to the rear wheels, and if a lot is scary, surely more is scarier? 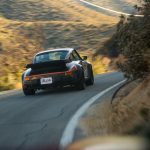 As it turns out, there's little to have worried about, because with modern tires and a more progressive boost threshold, this 930 is as docile as any air-cooled 911 has ever been. If you know what you're doing, that is. While this Porsche and mine both have factory sport seats, the 930 has a sunroof, and is still fitted with the factory 380mm steering wheel (versus my 350mm Momo), making the driver's seat an inhospitable place for my 6'2" frame. Now, admittedly I haven't got a great torso-to-leg ratio, and find my knees interfere with the steering wheel of most cars I drive, I did not expect to have my head in the ceiling to boot. With a slightly lower seat mount and a smaller diameter steering wheel, however, every single one of my qualms with this Porsche would evaporate. It's an exquisite example of an incredible 930. The aesthetic is very of-the-era, but what was old is new again. This is the kind of Porsche I spend nights dreaming about. Despite what the bright mid-afternoon sunshine would have you believe, the winter wind is still beating around the shoulders, biting and cold. The road is dry, curvy, and clear of any traffic. Spool it up, this is turbo weather. The larger turbocharger takes longer to spool than the stock turbo would, building a lot more power, but it comes in higher on the tach, and builds much more progressively, assuaging some of that snap oversteer fear. As with any other rear-engine car, simply get all of your braking done in a straight line, gather up the steering you need to make the corner, and gently apply steady throttle through the corner. As with any turbocharged car, keeping your foot steady on the throttle actually contributes additional acceleration power as boost builds. It requires a bit of mental heavy lifting to keep on top of the boost, as I needed to slightly pull throttle input to keep the power delivery steady. After a few corners, I found a rhythm and worked to keep the 930 churning in the upper reaches of the rev range. I will admit, compared to my flat-four with a heaping helping of extra-loud, the 930 was as quiet and composed inside as most modern cars. Even with a freer flowing exhaust slung on the back, this Porsche gave very little auditory clue as to how many RPMs you might be turning. Once the boost builds, the engine builds revs rapidly, and combined with its natural quietness, I recoiled sheepishly as I found the rev limiter thrice during my time with the car. That boost is an addictive substance, I quickly found out, as on straight sections of road I was dipping into it for no other reason than to feel the whoosh. It's easy to see that this Porsche could get out of hand if you let it, but if you treat it like a gentleperson ought, it'll return the favor. I walked into this experience expecting it to be as rough and rowdy as a 934 Le Mans racer of the era, but as I turned off the engine for the final time during my tenure at the wheel, I was left feeling that I'd just driven a 911 with heaps of power. It wasn't scary or eye opening or life changing, as I thought it might be. This was a learning curve I'd already learned years ago when I stepped into my first 911. With prodigious grip and reasonably linear power delivery, this Porsche drove like basically any other air-cooled 911. When you're in full boost, you'll want to make sure the wheels are pointed straight ahead, but that aside, a 911 is a 911 is a 911. The DNA doesn't change with power level. As I piled vegetables on my tortilla, I lamented the idea of giving the 930's key back to Patrick in exchange for the ones I brought to the party. Don't get me wrong, I absolutely adore my 912E, but I'd be foolish to not think this 930 an upgrade. For one thing, it's in nearly-perfect condition with under 60,000 miles on the chassis. For another, that turbocharged engine is a gem of power delivery with around 400 horses on tap. Anyone who has ever experienced 911 ownership could easily step behind the wheel of this hero-grade classic and not feel out of place, or scared of the handling characteristics. I could very well have driven the car home that afternoon, but there's the small matter of the price; $135,000.